What If He Had Sent The Word `TORPEDO’ Instead? 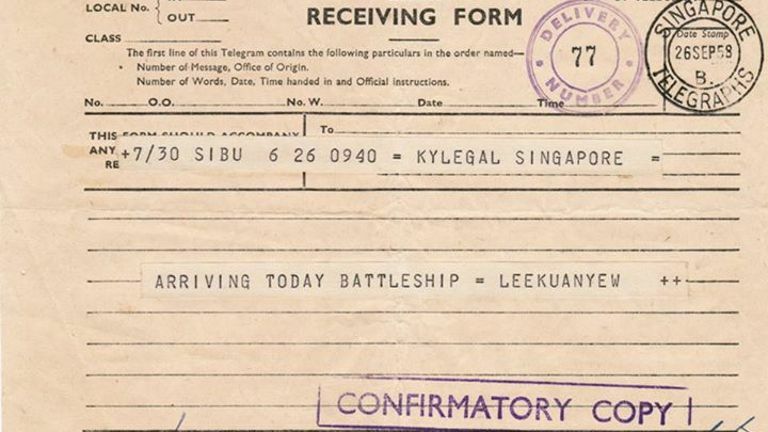 SINGAPORE – Prime Minister Lee Hsien Loong on Monday shared on his Facebook page a photo of a telegram that was sent by his father in 1958. In it, the late Mr Lee Kuan Yew, who was then in Sarawak, Malaysia, and practising as a lawyer, had written: “ARRIVING TODAY BATTLESHIP = LEEKUANYEW”. PM Lee said that his mother did not understand the message. “Was my father coming home on a battleship? The Lee & Lee secretary called the British Naval Base at Sembawang to check if any battleship was arriving from Sarawak, but they knew nothing about it,” he wrote. Mr Lee had in fact wanted to tell his family that he wanted to have steam boat for dinner. “My father did arrive home that day, but not by battleship. He explained that he wanted steam boat for dinner, but as ‘steam boat’ was two words, and telegrams were charged by the word, he wrote ‘battleship’ instead, to save words and money! Sadly, since we had not understood the message, we did not have steam boat for dinner that night,” PM Lee wrote in his post. PM Lee found the telegram while sorting through his father’s things at home. Mr Lee died on March 23 at the age of 91.